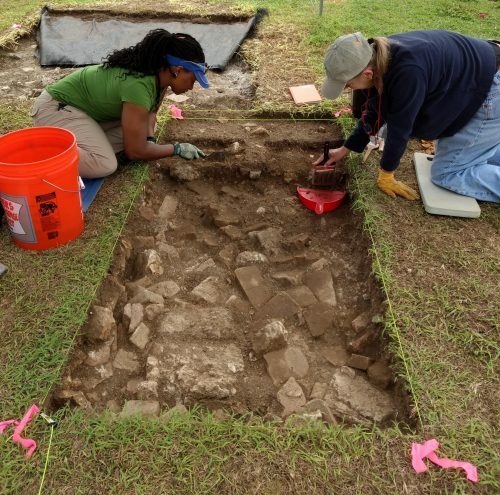 The National Park Service Southeastern Archaeological Conference (SEAC) in collaboration with the Slave Wrecks Project is supporting environmental archaeology research in association with their archaeological project at the Christiansted National Historic Park, St. Croix, US Virgin Islands. This project works to understand the park’s cultural resources and to gain insight into the role of the Danish East India and Guinea Company Warehouse archaeological site as it pertains to slave life and the Trans-Atlantic Slave trade (Hardy 2016). The Christiansted National Historic Park, located in the town of Christiansted was a large, Danish administration complex that consisted of Fort Christiansvaern and Stable Yard Building, Steeple Building, Danish West India and Guinea Company Warehouse, Danish Customs House, Bandstand and Scale House. During the colonial period (1733-1848), the site served as a military and trade depot where slaves and Danish soldiers, both in service to the Danish crown shared the same urban space but with separate activity areas and life experiences (Odewale et al 2017). This site was central to the plantation economy of St. Croix as a major trading port during the Trans-Atlantic Slave Trade Era, dealing primarily in the trade of enslaved Africans. understanding of slavery in the Danish West Indies and the larger African Diaspora. We are also planning an outreach component to explain our findings and the importance of ancient plant and animal materials in archaeological research. Hardy, Meredith D. 2016 Research design for archeology at the Danish West India and Guinea Company Warehouse (CHRI-02, 12VAM1-201.04), and the Danish well tower (SARI-04, VAM1-321), Christiansted National Historic Site and Salt River Bay National Historical Park and Ecological P. Tallahassee. Odewale, Alicia, H. Thomas Foster, and Joshua M. Torres 2017 In Service to a Danish King: Comparing the Material Culture of Royal Enslaved Afro-Caribbeans and Danish Soldiers at the Christiansted National Historic Site. Journal of African Diaspora Archaeology and Heritage 6(1): 19–54.